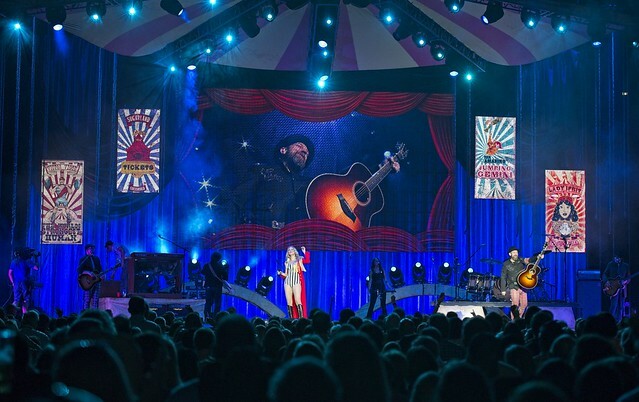 Sugarland: Still The Same Tour Reviewed by Derek Baker on August 7, 2018 . 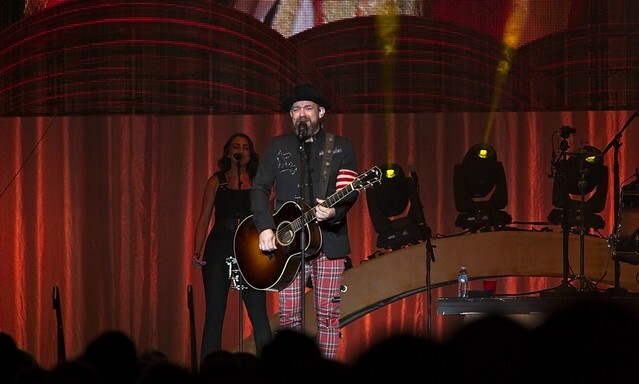 It’s been 8 years since their last album, but now Sugarland is back and making sure the everyone knows as they set off on their Still The Same Tour. Since forming in the early 2000s, they quickly became an iconic duo on the country scene. 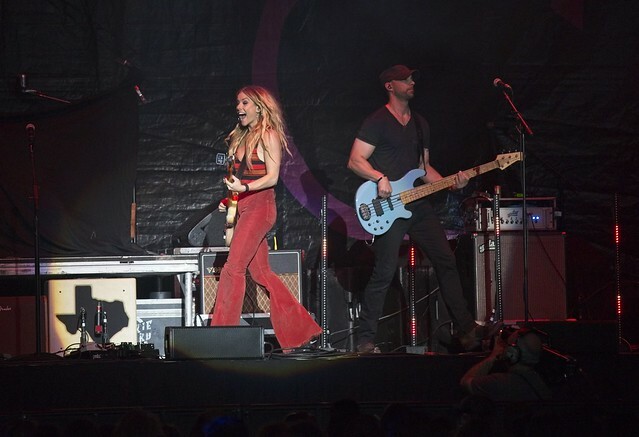 With their amazing ability to create music that blends country with pop and mixes in hints of rock, they band connects with a wide variety of fans. 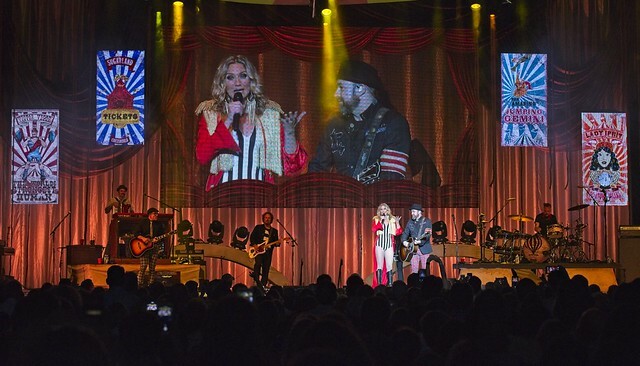 This dynamic duo consists of both Jennifer Nettles and Kristian Bush. From the moment their debut album Twice the Speed of Life released, it instantly captured the ears of many with such hits as “Baby Girl” and “Something More”. Although at that time Kristian was mainly lending his instrumental and vocal abilities to the group, it wasn’t until the release of their second album Enjoy The Ride that they truly became a duo. As they continued to release albums they began to rack up more and more number one hits including songs like “All I Want to Do”, “Want To” and “It Happens”. The most recent album titled Bigger was finally released on June 8th, 2018 after a five year hiatus of the duo as they went to work on solo albums. Needless to say, fans are ecstatic to see them back together and touring now and that was very noticeable on Saturday night in Greenville, SC. 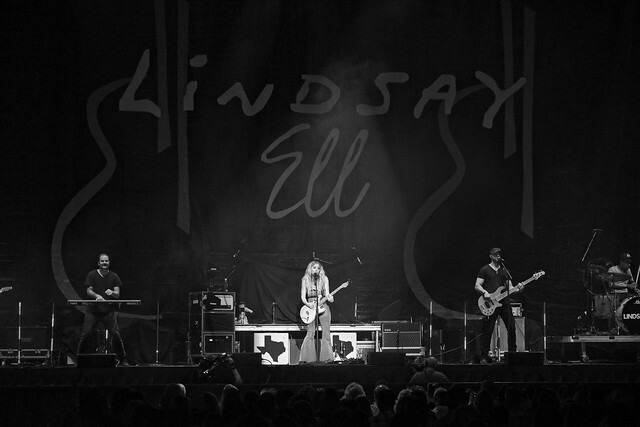 As the night began, upon the stage was a large backdrop with the name Lindsay Ell written upon it. Lindsay was an opening act there to promote her latest album The Project, which made sense because Sugarland’s own Kristian Bush was the producer of said album. As the clock struck seven it was time to meet this country Canadian. As her band began a ramp up instrumental for her, she walked onto the stage while shredding her electric guitar. She introduced herself to this South Carolina city and proved why it’s always good to get to a show early to see the opening acts. 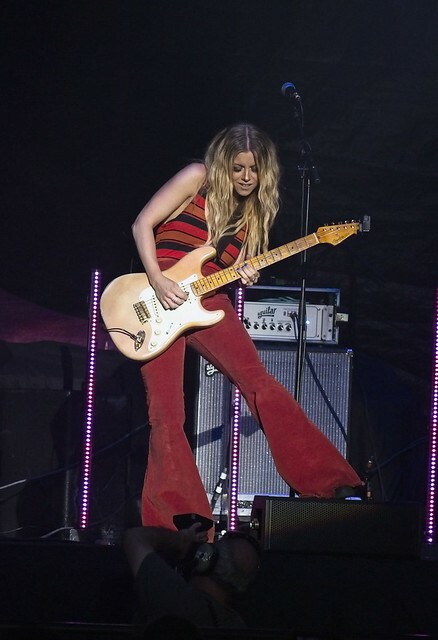 A twenty minute set full of guitar riffs, whimsy yet serious vocals, and catchy tunes that felt inspired by Sheryl Crow got the crowd started and prepared for a night of fun and down right amazing music. After a short set change and a new backdrop it was time for the next artist to take the stage. 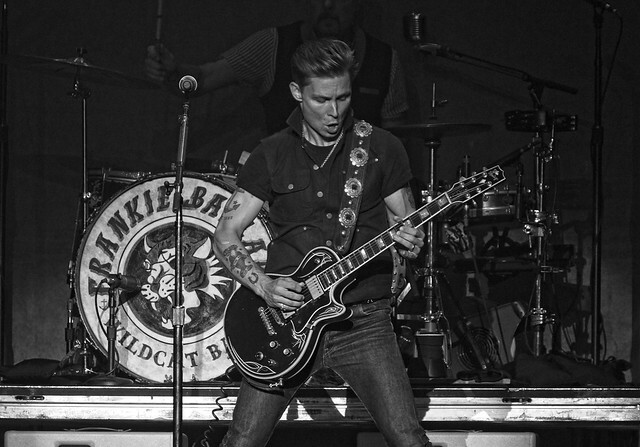 Frankie Ballard got his start in country music when he competed in Kenny Chesney’s Next Big Star competition back in 2008 and won. Since then he has released three albums, the latest of which is titled “El Rio“. Kicking off his set we witnessed a strobing of lights focused on the drum set, while a voice over intro prepared us for the band and Frankie himself. The intro felt as though it was straight from the fifties, as it gave a feel of classic rock and roll that gave a visual of classic cars, slicked back hair, and leather jackets. Frankie appeared on stage and completed this thought as he wore blue jeans, a black button up and slicked back hair paired with dance moves that channeled an inner Elvis. We were given a variety of songs spanning his career so far including hits such as “Sunshine & Whiskey” and “It All Started With A Beer” before he wrapped up his set and thanked the crowd. Finally the time had come, the main event was upon us and it was easy to know we were in for a treat as a red curtain now covered the front of the stage. House music is amplified to get the crowd dancing and then we heard the smash hit of 2017, “The Greatest Show“. As the lyrics “ladies and gents, this is the moment you’ve waited for” are played the stage lights up and strobes as the live band begins to play. We hear Jennifer’s voice as shadows of her and Kristian are projected onto the curtain. The crowd rises from their seats and the curtain drops. What lies behind that curtain was a stage designed to feel as if you were under a big top circus, as vibrant colors and an excellent yet simple set design are seen. Jennifer was seen wearing a black and white striped one piece leotard accented elegantly by a red long-tail jacket with golden tassels upon her shoulders. They kicked off their set with songs both new and old beginning with the title track to their latest album ‘Bigger’ before leading into songs such as “All I Want To Do“ and “Stuck Like Glue” that got the fans smiling from ear to ear. A few songs in, upon the stage a curtain opened that has served as a backdrop for the set up until this point revealing tiny LEDs on a net that give a look of stars. This set the scene for slower tempo songs such as “Want To” and “Already Gone”. This gave proof to just how talented this duo is, as Jennifer’s vocals are both unique and powerful paired with Kristain’s voice and guitar. There comes a time when they tell the crowd that “here in Sugarland, everyone matters and words matter”; they then cover a song by Patty Griffin named ‘Tony“. If you’re not familiar with it, it is a song that tells the story of how one boy is bullied because of his looks and drives him to contemplate and ultimately take his own life. As the song begins “Sugarl&” is shown on the screen along with the description “& = everyone belongs here. Including you & you & you”. Throughout the song statistics are shown upon the screen that encourage equality and get the crowd thinking how impactful negative words can truly be, while also sharing suggestions on how to better the world we live in by simply being kind to one another. Shortly after, Jennifer left the stage as Kristian Bush remained center stage. He began to snap his fingers to the beat of the music now being played by the band, the crowd joined along. He spoke to the fans and addresses the fact that it has been awhile since they’ve been on tour, but not because they were on vacation. Instead they were working on solo albums and that the next two songs were songs off those albums. Before beginning his song “Trailer Hitch” off his Southern Gravity album he interacts with the crowd mentioning if they get up and go to the bathroom during this part that he can see them. It gets a good laugh from the crowd. After Kristian’s song, Jennifer Nettles returned to the stage wearing ruffled burgundy shoulder accents along with a matching bottom half that was beyond elegant. It was her turn to perform a song off her solo album “Playing With Fire“. The song she chose was “Unlove You”, a slower song that shows the true range of her voice and created an incredible emotional performance. Each note that she sings is with purpose and her subtle physical movements add to her songs as it is clear she connects with each one. As the night comes closer to the end there are plenty more hits to play and the band came to groove as guitar solos blow minds and melt faces in songs such as “Incredible Machine” and “Settlin'” that create a feeling as though it’s the finale, but we weren’t there yet. Jennifer then took a moment to joke with the crowd and mention how amazing but young their opening acts are while reminiscing on the venues in Greenville they’ve played at over the years. She then asked the crowd if they were having fun which got a loud positive response, she then said “let’s have a party tonight” as a disco ball is then shown on the screen and they begin their song “On A Roll” which after the second verse got a bit of a remix. They played hits such as “Give Up the Funk”, “Billie Jean” and “No Parking (On The Dance Floor)” the later of which gets Jennifer to break out her dance moves, including the robot. All of this squeezed in before finishing the final verse of “On A Roll“. It was a moment of pure energy and fun. They then mention they have a single on the radio currently with their friend Taylor Swift, which leads them into the song “Babe“. As concerts typically fill the area with the sound this one was a bit different, during this song the vocals moved around the arena in a way that felt like surround sound. Later they give the crowd their biggest hits, as songs such as “It Happens” and “Baby Girl” get the phones to come out in droves to capture favorite songs live. Then something happened… the stage went dark, Jennifer and Kristian were center stage, then the spotlights illuminate them. Kristian began to play his acoustic guitar as Jennifer sang the first verse of “Stay”. They crowd was in a trace as they sung along, they did so well in fact that the entire first chorus was purely the voices of the fans. As she progressed through the song fans were completely in love and readied their phones for the powerful vocal toward the end of the song. As the night came to a close they dedicated the encore song to the audience. The song here is one titled “Not The Only”. At the end of the song she hugs Kristian and all of the sudden bright white lights fill her hands, she then hands a single light to each band member on stage. They all hold up their lights and wave them, the audience joined in by raising their flashlights on their phone and although you see this at many concerts this one felt different because the band truly embraced the technological world we live in. Finally we went out with a bang as a guitar was heard hitting a solid note, and Kristian said “Dearly Beloved” spinning us into the world of Prince and his hit song “Let’s Go Crazy”. 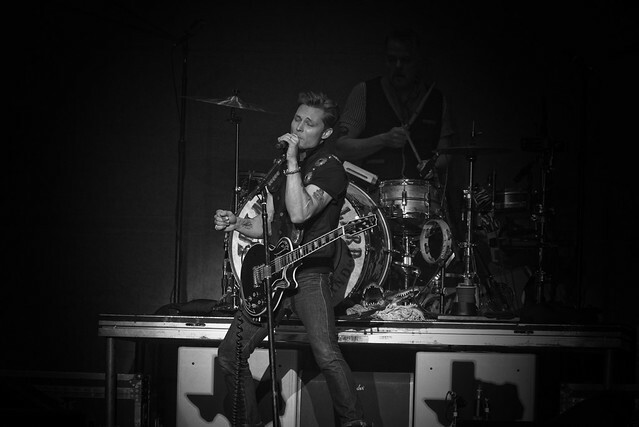 At this time Frankie Ballard is back on stage singing and playing his guitar while Jennifer and a female background vocalist wear wedding veils and begin to sing and dance. Although, this finale is a bit different as the mascot for the Greenville Swamp Rabbits is now on stage shredding a guitar, seriously playing too. 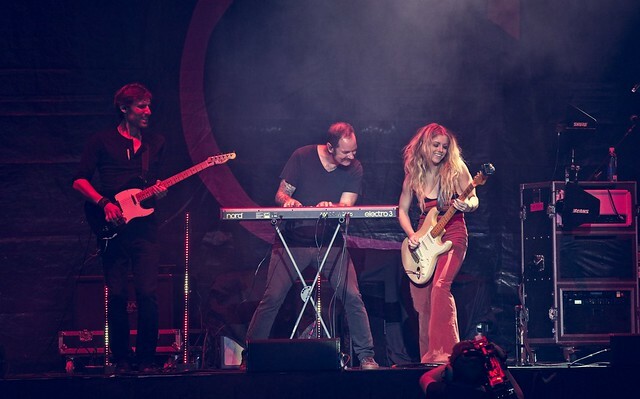 We come to find out that in that mascot outfit is Lindsay Ell who was pranking her fellow tour mates. All in all this was one amazing show that features some legendary musicians and a night for the books. Make sure to catch the Still The Same Tour as it runs through early September. The remaining tour dates will bring this extravaganza to many states in the midwest so take the time to buy a ticket and treat yourself to a show that proves that live music is truly still alive. One of the biggest things that stood out from this show is the sense of genuine happiness and positivity from both Jennifer and Kristian, smiles were a constant and having fun came natural and at no point felt forced. Go experience something you can’t quite get from streaming a song, get your tickets now.